The flattening of homes in Legetafo Legedadi has caused havoc for thousands. As usual, the poor and women are the worst affected. In February, bulldozers began demolishing thousands of homes in Legetafo Legedadi, outside Addis Ababa. 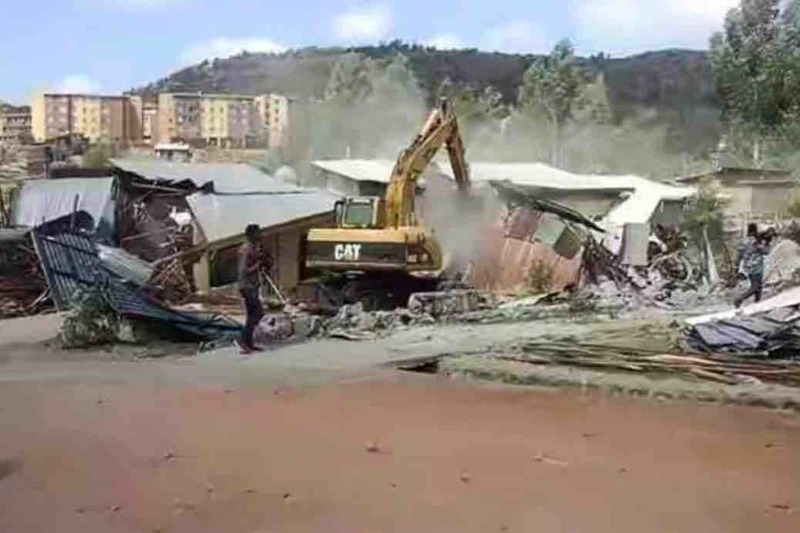 On 19 February, bulldozers descended on Legetafo Legedadi, on the outskirts of Ethiopia’s capital Addis Ababa, and began demolishing over 3,000 homes. With little warning, thousands of people were made homeless and businesses were left in ruins. The local administration said this was the start of a plan to tear down 12,000 settlements in the coming months. Several residents – many of whom are now stranded in church compounds or staying in cold shelters with meagre sanitation, food and water – were traumatised by the experience. “While I was on the bed, holding my newly-born grandchildren, they bulldozed my home,” an elderly woman told journalists. “I asked them to stop but they refused and covered me with dust”. The administration of Legetafo Legedadi and Mayor Habiba Siraj see home demolitions as a necessary step in implementing the town’s 2017 master plan. As state policy, the flattening of residential neighbourhoods is often presented as part of urban development strategies. In the case of Legetafo Legedadi, both the local and Oromia regional government have also made two particular arguments to further legitimise their actions. This narrative is disputed, however, by residents who say they have legal papers and residence cards and that they have long been paying taxes on their properties. Many have lived in the area for over a decade, predating even the establishment of the city administration in 2008. Secondly, the authorities have utilised the rhetoric of environmentalism and urban development to justify their interventions. “The areas were slated for greenery spaces, manufacturing hubs and various investment projects,” said Arega. These initiatives are purportedly in the interests of the region, but the discussions rarely involve wide consultation or the participation of those directly affected. Local authorities take a narrow view of environmentalism, urbanisation and what “beauty” means in regards to the town. They silence any alternative interpretations and unilaterally declare people’s homes to be obstacles to their vision. Through the media, officials depict themselves as the enlightened agents acting in the interests of the town and environment. In contrast, they paint the residents of demolished homes as illegal and destructive forces who need to be ordered and controlled. Among other things, this portrayal makes it easier for the administration to sidestep questions around compensation and the provision of alternative housing for evictees. This narrative has not allowed the government to completely avoid criticism however. The Association of Human Rights in Ethiopia (AHRE), for example, wrote an open letter to Prime Minister Abiy Ahmed calling the recent operation a “clear violation of the right to housing”. It called on him to order local authorities to “immediately stop mass demolition and evictions; and compensate those families whose houses were demolished”. The UN Special Rapporteur on Adequate Housing, Leilani Farha, also responded to events in Legetafo Legedadi. She tweeted: “the Rapporteur will be investigating this issue and reminds all actors involved that forced evictions constitute an egregious violation of the #Right2Housing”. National media outlets have emphasised the lack of notice given to residents, the havoc created by the policies, and the dire situation in which vulnerable people have been left. Evictees have been widely quoted complaining of intimidation by security forces and insisting that their removal is inconsistent and contravenes the 2011 Urban Land Lease Holding Proclamation. The federal government’s position and responsibility in the evictions is difficult to assess. Thus far, however, it has mostly been a complicit distant observer, pointing out that the prime minister does not run the affairs of local administrations. The Legetafo Legedadi demolitions have impacted many people, but as is often the case in crises, women are disproportionately affected. In much of Ethiopian society, women spend a large proportion of their time around the home, whether performing domestic labour or running small businesses. Demolishing the household sphere therefore undermines both women’s private domain and, often, the basis of their financial income. It also limits their availability as employees and civil servants due to their unequal responsibility as mothers and family caretakers in precarious situations. Once homeless, women are also typically more vulnerable to abuse and exploitation, while pregnant women in particular face serious health risks. As well as reinforcing socio-economic divides then, the demolition of thousands of homes also exacerbates inequalities between men and women. At the top, Prime Minister Abiy has made big changes to Ethiopia’s gender landscape by ensuring the equal representation of men and women in his cabinet and appointing a female president and chief justice. But situations like Legetafo Legedadi show how for the vast majority of women, policies are still deeply rooted in patriarchal systems and have unequal results. To truly address these divides, Ethiopia needs to address gender genuinely in political commitments at all levels. The country’s urban development policies must not only be pro-poor and ethnically-sensitive if they are to benefit the majority of people, but awake to the everyday experiences of women. *Yeshiwas Degu Belay is completing a masters at the University of Groningen, The Netherlands, and is a research intern at IHE Delft. Yohannes Eneyew Ayalew is a lecturer in Human Rights Law at Samara University, Ethiopia.